Yes, today is National Fluffernutter Day. I've always loved that word, because it sounds so silly. But when I looked into the day, I found it has a bit of history to it. During World War I, Emma and Amory Curtis of Melrose, Massachusetts, invented something called Snowflake Marshmallow Crème. They published a recipe for a peanut butter and marshmallow crème sandwich, which became the earliest known example of a Fluffernutter, although it wasn’t called that at the time. In 1917, Archibald Query of Somerville, Massachusetts, invented Marshmallow Cream. (Apparently, marshmallows were big in Massachusetts.) He later sold the recipe to Durkee-Mower, Inc., who renamed the sweet spread Marshmallow Fluff. The term Fluffernutter was created in 1960 by an ad agency in an attempt to market the peanut butter and marshmallow sandwich. The Fluffernutter is so revered in Massachusetts that a bill was initially approved in April of this year that would make it the state sandwich. You may be wondering, how does one make a Fluffernutter? I'm glad you asked. You need three things: White bread, creamy peanut butter, and a jar of Marshmallow Fluff. 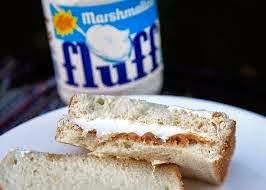 Slather peanut butter on one slice of bread, Marshamllow Fluff on the other slice, then slap them together. So today, think about the Fluffernutter, a humble, salty/sweet sandwich whose only goal is to delight the taste buds and bring a smile to the lips. Sandwiches like this make the world a better place. 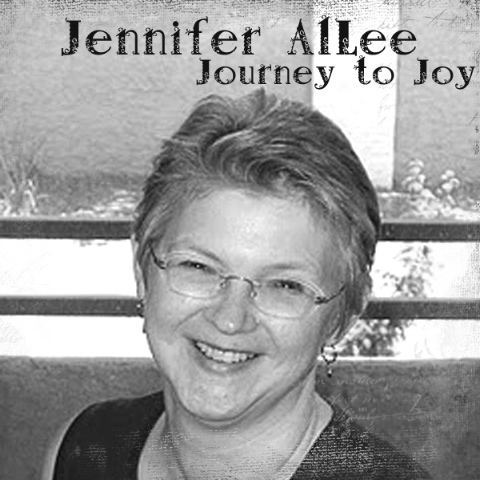 JENNIFER ALLEE was born in Hollywood, California, and spent her first ten years living above a mortuary one block away from the famous intersection of Hollywood & Vine. Now she lives in the grace-filled city of Las Vegas, which just goes to prove she’s been blessed with a unique life. When she’s not busy spinning tales, she enjoys playing games with friends, attending live theater and movies, and singing at the top of her lungs to whatever happens to be playing on the car radio. Although she’s thrilled to be living out her lifelong dream of being a novelist, she considers raising her son to be her greatest creative accomplishment. 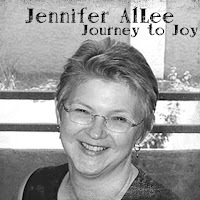 She's a member of American Christian Fiction Writers, Romance Writers of America, Christian Authors Network, and the Christian Fiction Blog Alliance. Her novels include The Pastor’s Wife, The Mother Road, A Wild Goose Chase Christmas, Last Family Standing, and the upcoming Vinnie's Diner (4/15) from Abingdon Press; Diamond in the Rough, Vanishing Act, and Curtain Call from Whitaker House and co-written with Lisa Karon Richardson; and the novella Comfort and Joy in the Christmas anthology, Mistletoe Memories from Barbour. Fun topic. I don't remember the last time I had one of those. Surely there's a historical novella in there somewhere. More importantly, today opens the season for the National HOCKEY League. Woo and hoo! DeAnna, I've never heard of it either...but then, I'm not a Yankee. Go... uh... Flames... yeah... go Flames! Hooah! I have never eaten a fluffernutter, but I think I've heard of it. It sounds like it would go rather nicely with a glass of milk. Mmm. I agree, with Susie. It sounds great with a glass of milk. But I'm not crazy about the white bread. I think we had Marshmallow Crème once while growing up. And I have a jar in my cupboard because I bought it for a recipe about 6 yrs ago and never used it. Of course, if someone had said it was sandwich filling it would had disappeared a looooooooooong time ago. SOOOO.... My childhood was not as deprived as I thought? I think I may have had this at one time or another in my childhood. It seems so familiar I can almost taste it. We were raised on fluffernutters, Jennifer - and, like you, I've always loved the word! To this day I still eat a version of it - peanut butter and marshmallow rolled up in a wheat tortilla for a quick-grab breakfast to-go!